The Birthdays add-on gives you the opportunity to mark the site members who are celebrating birthday today, or have celebrated birthday recently, or will celebrate soon. A special icon is displayed next to the main photos of the birthday boys and girls. 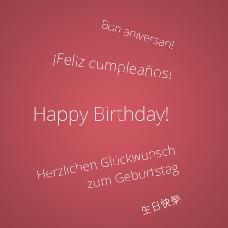 The system will also send a birthday greeting by email. The default image is balloons. You can upload another image, a transparent .PNG, instead. If you know how to improve this add-on, share your thoughts with us. Contact us by email: sales@pilotgroup.net or leave a review below.